Czech president says his ‘doors are closed’ to US envoy over Moscow WWII visit comments — 1389 Blog - Counterjihad! This makes me proud to be a Czech American! 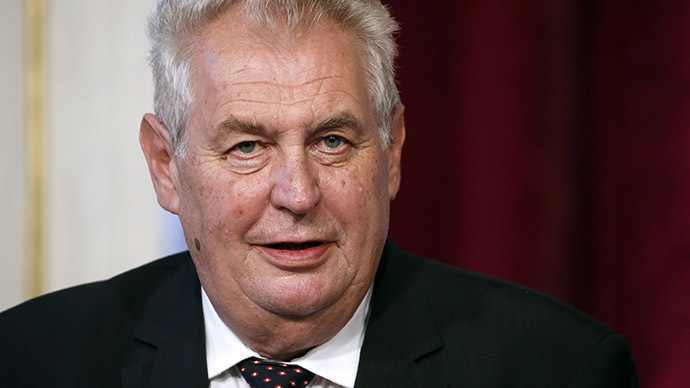 Leader of the Czech Republic, Miloš Zeman, says he won’t let any ambassador of another nation intrude with advice over his foreign visits. This comes as the US Ambassador criticized Zeman’s plans to go to Moscow’s celebration of the WWII parade. “I’m afraid, after this statement the doors of the Prague Castle are closed for Ambassador Schapiro,” Zeman told Parlamentni Listy webportal on Saturday. Prague Castle is the president’s official residence and office. Earlier, the US ambassador to the Czech Republic, Andrew Schapiro, criticized Zeman’s decision to go to Russia for Victory Day celebrations in May. He called the plans “short-sighted”, as it would “be awkward” if the Czech president was the only statesman from an EU country on Red Square. In the interview, the president also voiced his concern over the current Western attempts to isolate Russia. “It is essential to maintain and develop relations with Russia not only on a commercial basis, but also, for instance, based on the strategic partnership in the fight against international terrorism,” he said. Previously, Zeman said that his visit to Russia would be a “sign of gratitude for not having to speak German in this country.” He also intended to pay tribute to the memory of 150,000 Soviet soldiers who died liberating Czechoslovakia. Washington is just panicking because it is apparently failing to isolate Russia, said the head of the State Duma Foreign Relations Committee Aleksey Pushkov. “Judging by the hysteria of the US Ambassador to the Czech Republic, Washington is nervous about Western countries’ leaders traveling to Moscow on May 9. Scared that the isolation will not work,” Pushkov said on Twitter. Andrew Schapiro, 51, is a Chicago lawyer who became an ambassador only half a year ago. By Saturday, 25 foreign leaders and several international organizations confirmed their participation in the celebration of the 70th anniversary of the Victory in the Great Patriotic War that is to take place in Moscow on May 9, the head of the Kremlin administration Sergey Ivanov said. The Soviet Union lost over 11 million soldiers during the war, constituting the biggest death toll among other members of the coalition, fighting against Nazi Germany. Military parades to mark the victory in the Second World War are to take place on the streets of 26 Russian cities. President Zeman’s demarche banishing the US Ambassador Andrew Schapiro from the Prague Castle is a welcome sign that at least some European leaders have drawn the line at Washington’s imperial-like bullying. After all there are limits to what they are prepared to tolerate. It is also an urgently needed reminder to Washington that some European leaders take seriously the values of democracy preached by America: genuine democracy is incompatible with the renewed Soviet-style practice of passing down instructions on how the foreign policy of putatively sovereign nations should be conducted. Although Zeman’s political role in the Czech Republic is honorary (rather than executive), it is to be hoped that the US political class will take notice and interpret his “disobedience” as proof that not everyone in Europe is ready to be pushed around without so much as a murmur. Fast forward to February 2014, when, in another illegal act, Kiev fell under the sway of a virulently anti-Russian US-backed regime. Anticipating trouble, the Kremlin swiftly responded by re-claiming Crimea. Would any self-respecting power risk the unleashing of terror on its fellow nationals by far-right “punishers”, not to mention the inevitable transfer to NATO further down the road of the Russia-leased Sevastopol naval base? We saw how Britain, with US support, acted to reclaim the Falkland Islands in 1982 (after they had been annexed by an Argentine fascist junta), eventually declaring its inhabitants British citizens. By reintegrating Crimea with Russia, Putin (like Mrs Thatcher) corrected a historical wrong and respected the publicly declared wish of the overwhelming majority of the territory’s current population. The US Ambassador in Prague may consider Zeman’s intention to take part in the celebrations in Moscow “short-sighted” and his appearance there “awkward”. However, many independently thinking people, not only in this country but throughout Europe and even in the US, may well see Zeman’s actions as a desperately needed affirmation of national sovereignty and, indeed, democracy. As the Czech President explained, he is going to Moscow above all to honour the 150,000 Soviet soldiers who sacrificed their lives in the liberation of this country from Hitler’s Nazi hordes. As he has put it, his visit to Russia will be a “sign of gratitude for not having to speak German in this country”. From an objective viewpoint, it is difficult to find anything disreputable in Zeman’s plans. Vlad Sobell lives in Prague and teaches political economy to university students both there and in Berlin. On January 19th 2015 the facebook group, which combines all members of the CSLA, PS, VMV, SNB in reserve or decommissioned, issued an important memorandum, which has become even more urgent in light of the situation today. A defensive back up location in the event that the group gets „disappeared“ from Facebook, the group of the same name exists on VK.com. as well. While Obama and his Blackwater mercenaries support the literal NAZIS in the unelected ‘government’ of Ukraine, and the Poles and others tremble in fear from Obama’s slanderous propaganda, the Serbs and Czechs have the right idea!